Making of bootable pen drive is easy. You can install a new operating system using the bootable USB. The software listed here takes the ISO image file and write it to the USB drive in a way that your PC can boot from the USB drive. The USB drive is Easy to create, erase and reuse. Can install multiple OS on same USB at a time. Faster booting and installation speed. Portable and easy to handle. How to create bootable USB From ISO? The type of bootable USB drive you are creating depends on the motherboard you are using. You need the ISO image file of the target operating system you want to install. That can be Windows 10, Windows 7 or any flavor of Linux like Ubuntu or Mint. If you don't have any, you can download the latest version of Windows 10 from Microsoft. Once you have the ISO image to start with, open any software from the list below. Insert the USB pen drive of minimum 4GB size. The bootable USB drive making software will automatically detect and list the drive. Make sure you select the correct drive as all the data on the drive will be destroyed. Now click on 'select' button and locate the ISO image file of the operating system from your hard drive. Select the appropriate option for partition scheme and other options and hit start. It will take around 15 minutes depending on your operating system size. If your motherboard is comparatively new, you may have to deal with the UEFI or the legacy BIOS if your computer is not that new. Both way, you can easily create bootable USB drive using all of the listed software here. 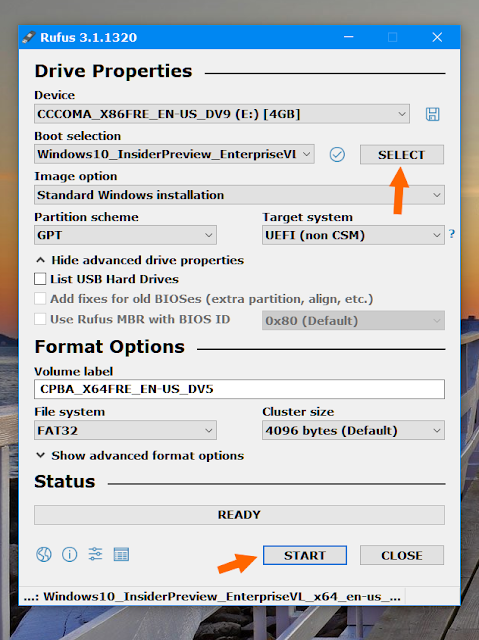 Select the target drive and file system (For Windows keep it NTFS). ➤ Select 'MBR partition scheme for BIOS or UEFI' from partition scheme and target system type. ➤ Keep the file system, cluster size as it is or you can change it to NTFS for Windows and exFAT for Linux. ➤ You can give an appropriate name to the resulting bootable drive. ➤ ISO image on your hard disk must be a valid bootable image because Rufus scans the image before you load it. ➤ Click the start button and wait for the process to complete. This may take up to 20 minutes. ➤ UEFI motherboards most of the time need 64 bit Windows. Else you will get 'Could not locate '\dfi\boot\bootx64.efi:  Not found' error. If you get this error, you just need 64 bit Windows version. The 7th generation Intel CPU does not support Windows 7 or older. You must have Windows 10. ➤ Select the ISO image file of OS you want to burn. ➤ Select 'GPT partition scheme for UEFI' from partition scheme and target system type. ➤ NTFS as the file system. If you create bootable USB using MBR scheme, you may get an error like 'Windows can not be installed. The partition is GPT type. Carefully check the options as above before you hit the start button. Once you have completed creating the bootable USB drive, its time to install the OS. For that, you have to boot from the USB drive. Restart your PC and press the key F12 or Delete depending upon the manufacturer of your PC. Sometimes this key may be different. Select USB drive as a first boot device from the boot menu. Rufus is a simple and easy to use. It automatically detects your USB flash drive and capacity so you can easily identify which device you are formatting. The bootable USB drive can be created for newer hardware supporting UEFI or for legacy BIOS. You only have to select proper options from the list. Tech Tip: Get an unrestricted remote access to your favorite Windows applications and data on your preferred device(PC/Mac/Linux/Android/iOS) with routine data backups on high-performance Citrix XenDesktop with an unbelievable XenDesktop pricing. You can also access complete MS Office suite on the same xendesktopXenDesktopng O365CloudExperts.com powered by Apps4Rent. It's all in one tool. Features come with the cluttered interface. If you don't know what are you doing, don't use it. I personally do not recommend it if you want a simple bootable USB to install a new operating system. RMPrepUBS is specialized in creating multiple partitions in a single USB drive. You can install multiple ISO of the different OS or save user files along with the side of the bootable USB. The special feature of RMPrepUSB is you can create a partition in USB drive just like you do on your hard disk making it more useful for saving files plus using the same drive as a separate folder for storing files. This keeps your files separate from the operating system files. Create ISO from the USB drive. Edit the hard drive grub or syslinux bootloader. Test speed of the USB drive. Specialized tool for creating bootable live Linux OS. It has a predefined list of most of the Linux distributions available. Give the path of ISO image and USB flash drive you want to boot from. Prepare a Live antivirus rescue disk using it. A special option for this is also given for reuse CD. Yumi, short for Your Universal Multiboot Installer. 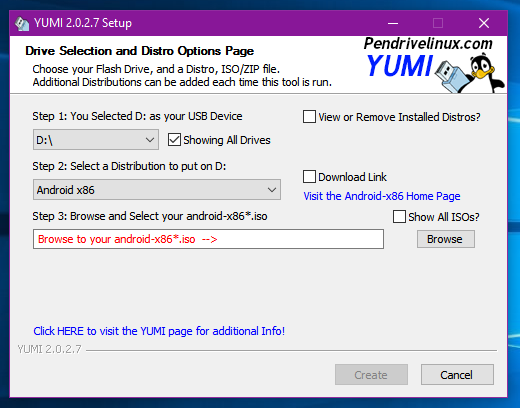 YUMI allow you to prepare the bootable USB drive multiple operating systems in one USB drive without formatting it. You can download the ISO of your favorite OS. YUMI have a large collection of free OS based on Linux and other free OS projects. Just select what you want and YUMI will give you the direct download link for it. The interface is quite easy to use and useful. This tool is an exact clone of Universal USB installer or you can also say Universal USB installer is a clone of UNetbootin. 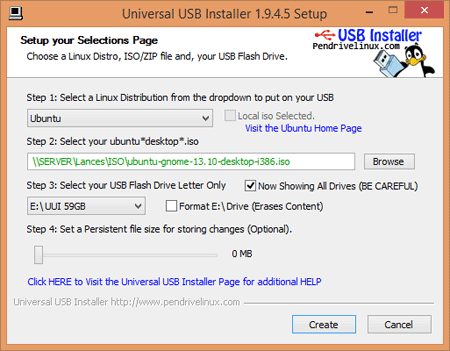 Create a bootable USB for any Linux distribution. If you are not using Windows as your host operating system, then UNetbootin is an option to go for. UNetbootin is available for Linux, iOS, and Windows. So if you are using Linux, most of the software's listed here will not run where UNetbootin will come to help. LiLi is one more software used to make bootable USB. The special feature called built-in Vitalization allow users to run the installed Linux operating system without restarting the Windows which are an exclusive feature of LiLi. If you are concerned only about Linux you must go for this. This is also a tool for those who want to install multiple operating systems on one USB device. WinSetup From USB let you install Windows XP, Windows Vista, Windows 2000, Windows 7, Windows 10, any Linux distribution. When you prepare the USB drive using ‘WinSetup From USB’ you will be presented with the list of operating systems installed on the thumb drive and select the preferred operating system to boot from. Though the interface is simple, non-expert users may find it difficult to use. 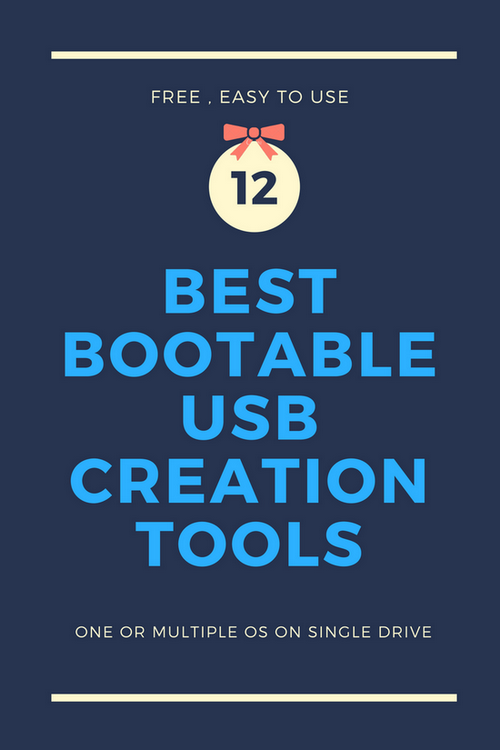 This is more than just a bootable USB maker. You can create a rescue CD or a disk having multiple operating systems or tools like antivirus rescue CD. It combines multiple tools in ISO image making it more useful than just a USB creating tool. XBoot can create ISO image from files and then write these files to USB drive for booting or installation. This is a straightforward and an ultra-small tool that accomplishes its job as you expect. It has a super simple interface and minimum buttons to avoid confusion of new users. This is a tool from AskVG. There are only basic buttons and only one task to do. Just create a bootable USB drive to install or try new operating systems. I wonder how it is so small and light. It is just 160KB in size. ➤ Novicorp WinToFlash is also a tool that will help you to recover deleted boot loader apart from creating a bootable flash drive. ➤ Windows official USB creation tool is an official tool to create a bootable USB drive to install downloaded Windows 7 and Windows 8 ISO images without burning it to traditional discs. ➤ FlashBoot is a bit tool having around 24 MB is download size. It has more options than any other tool but is actually a paid tool, but anyone can use it for free. ⏩ 'Rufus' is best of everybody. ⏩ 'LiLi' is the best choice for Linux specialists. ⏩ 'WinSetup From USB' is for installing multiple OS in one USB drive. ⏩ 'RMPrep USB' is for making the partition in USB drive along with Windows. ⏩ If you want to clone a complete partition with OS 'WinUSB Maker' is the best choice. Which tool do you think is the best? Do you have any other good tool to list? Hirens 2018 New Generation is Back All In One Boot Disk! I will not take advice from articles that don't clearly publish the date of the article written, The info is usually old and useless. Hi, thanks for the reply. You are correct. I should display the date of article. But dont want to hide the date of publication. The blogger date has a problem with SEO which create multiple and duplicate description tag. that is the reason to disable the date. But still the I will try to find a different way. I'm trying to install KolibriOS, the world's lightest and fastest OS. But I don't understand the technical stuff on their forum. I'd appreciate if you could make an article with a runthrough of what needs to be done for USB booting. Hi, I will try to help you for sure. I have downloaded the OS and trying to install it using various USB booting software listed above. as soon as I succeed i will let you know. Well? Any progress on KolibriOS? Hi. I tried to install all the tools listed above. But the problem is that, as per the forums of the developer of KolibriOS, It is not a Linux OS at all and a completely different built so the all these tools will be of no any use. But as per the same forum the procedure is too simple. You just have to extract the downloaded archive and copy and paste all the files to a formatted usb drive. This will surely make your drive boot to KolibriOS. Copied the operating system onto a formatted pendrive, didn't work. Set Master Boot Record on a formatted pendrive and tried again, didn't work. Downloaded the ISO version of the OS called "svn2978-iso". Used YUMI, selected the ISO file and it booted in 3 seconds. Used Rufus to create bootable Xp USB and it worked like charm!!! You are welcome. Rufus is really a great software that can be used by anyone, newbie as well as advanced user to create a bootable usb drive. There are also multiboot programs that allows you to have several bootable isos at once and choose which one to boot from. * Xboot, I think Yumi works better but this one allows you to emulate the booting process from Windows. Anyway, sometimes other tools work better. Yes, Yumi is really a good tool. I will surely include it. Thanks for the information. Will try the Xboot also. Windows 7 SBB Tool, Passcape ISO Burner and Novicorp WinToFlash are another great tools. Well thanks Pravin for listing all the useful tools. I have used Rufus among all these. It is working beautifully for me. You may add SUSE Studio ImageWriter to the list. Hi, the tool is more of Linux world, so not yet used it, but will surely try it. Thanks for the information. Hello and thanks for this article. I would like to know if Rufus is good for installing a bootable usb window xp intall. I used Rufus and it formatted my 8 GB usb then copied the XP iso into it. The whole operation went very well. But when booting using my prepared usb I got a hal.dll error message. Please help. Thank you. I must tell you that old OS like Windows XP do not support booting from USB drive. Please try other Windows OS or Linux. hey guyz which one iz da best for win8?? i need that one plz..
hhey guyz which one iz da best for win8.. i need that one.. If you want a straight forward way, use Rufus. Its the best. 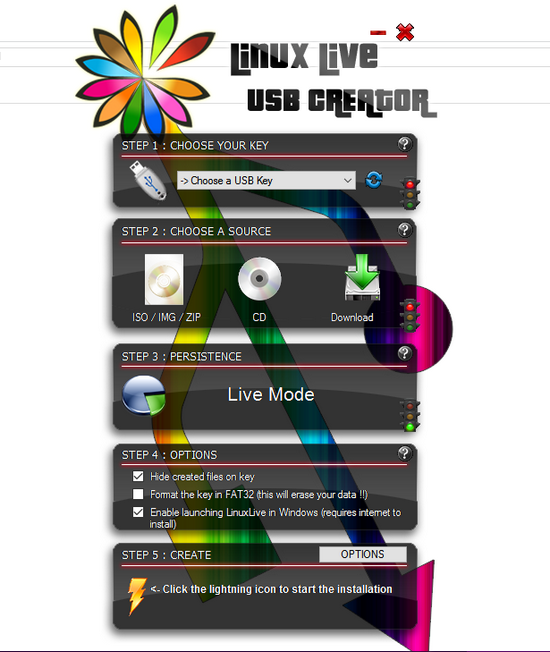 What about LinuxLive USB Creator? Hi Benn, that is already included in the post. It is also called as LiLi. Short for Live Linux USB. I have a windows PC with a virus. I was thinking I would make a bootable USB with antivirus software, boot and then clean the hard drive. Which of this USB utilities do you think would work best? Or do you have another suggestion. Thanks a lot man.. Top 1 worked. Installed my windows. Hi, I think Ultra ISO is a paid software and we have included only the completely Free applications and not the trial versions. That is why, Ultra ISO is not in the list. So useful! Keep works to reduce complexity! Thank you from Indonesia. Hi, my pc has got more than 1 operating system(windows xp) due error...i want to get rid of inactive operating system,,advise me the easy way...i currently boot from drive E. which is ok.. i want to delete corrupt windows file from drive C(1 windows) and D(2 windows)...I dont want my pc to get hanged again..kindly advise me the safest way..thanks..
Hi Jay, better way is to delete and format those partitions C and D while you are installing the OS. You get that option when you install new OS. But if you already have installed it and you format the partitions now, you may get the boot partition not found error. I suggest you to install it once more and clean with deleting and formating the C and D drive. For a multiboot USB drive checkout Easy2Boot on the RMPrepUSB website. for solaris which is best?? Thank you, this post was very useful as a reference. ...are blocked by the HOSTS file managers (hpHosts, MVPSHosts, Peter Lowe's AdServers, etc.) and many anti-adware/anti-malware browser extensions and utilities. Shame on you for using it; it makes you and this site untrustworthy. If you cannot understand that, and why, then that, too, is part of the problem. Which is best for ubuntu? i think,,,yumi is best & simplest. WinSetupFromUSB 1.7 - Very nice, made a multi-bootable usb with 2 linux iso's and Acronis True Image iso. Xboot 1.0 beta 14 - useless, had error about "MANU" (should be MENU) in boot loader config. Rookie BS Fail! Also copied my linux isos to the usb twice wasting space and possibly overfilling it. This program is trash. Yumi 2.0.3.9 - did not like the limited pre-determined iso style of it. Did not even bother to test it further. Try www.easy2boot.com - for most ISOs, just copy the ISO files to the USB stick and boot. dude which of them support hybrid iso file? I think, your New bios do not support the external USB or your Bios is locked to the Windows os. You can search for the term UEFI bios. You can surely turn off the feature if you want but the latest operating systems like Windows 10 need it for fast boot feature. Is there any way to create a live android OS with persistent storage? The only one that creates persistent storage is Universal USB Installer, but that's only for Linux and i already have Linux Mint. The live OS features are depend upon the OS itself. Not the burning application you are using. So if the Android OS allow you to use the persistent storage while using live disk. you can do it with any app. Hi, is there any way to create persistent storage for my live iso Android OS? What you want to install? GPT partition of Hard drive or you are asking about USB Drive? If you are asking about GPT on USB drive, Latest version of WInsetup will help. I don't think, the bootable USB have anything to do with your BIOS. Please refer to your motherboard manual to boot in to BIOS or UEFI.